Azure Mobile Apps use a variety of external identity providers to support authenticating and authorizing application users, including Facebook, Google, Microsoft, Twitter, and Azure Active Directory. Permissions can be set on tables to restrict access to authenticated users only. This article explains how to use Azure Mobile Apps to manage the authentication process in a Xamarin.Forms application. Register your Azure Mobile App at an identity provider's site, and then set the provider-generated credentials in the Mobile Apps back end. For more information, see Register your app for authentication and configure App Services. Define a new URL scheme for your Xamarin.Forms application, which allows the authentication system to redirect back to Xamarin.Forms application once the authentication process is complete. For more information, see Add your app to the Allowed External Redirect URLs. Restrict access to the Azure Mobile Apps back end to only authenticated clients. For more information, see Restrict permissions to authenticated users. Invoke authentication from the Xamarin.Forms application. For more information, see Add authentication to the portable class library, Add authentication to the iOS app, Add authentication to the Android app, and Add authentication to Windows 10 app projects. In iOS 9 and greater, App Transport Security (ATS) enforces secure connections between internet resources (such as the app's back-end server) and the app, thereby preventing accidental disclosure of sensitive information. Since ATS is enabled by default in apps built for iOS 9, all connections will be subject to ATS security requirements. If connections do not meet these requirements, they will fail with an exception. ATS can be opted out of if it is not possible to use the HTTPS protocol and secure communication for internet resources. This can be achieved by updating the app's Info.plist file. For more information see App Transport Security. The application that hosts the web view can access the user's full authentication credential, not just the authorization grant that was intended for the application. This violates the principle of least privilege, as the application has access to more powerful credentials than it requires, potentially increasing the attack surface of the application. The host application could capture usernames and passwords, automatically submit forms and bypass user-consent, and copy session cookies and use them to perform authenticated actions as the user. Embedded web views don't share the authentication state with other applications, or the device's web browser, requiring the user to sign-in for every authorization request which is considered an inferior user experience. Some authorization endpoints take steps to detect and block authorization requests that come from web views. The alternative is to use the device's web browser to perform authentication, which is the approach taken by the latest version of the Azure Mobile Client SDK. Using the device browser for authentication requests improves the usability of an application, as users only need to sign-in to the identity provider once per device, improving conversion rates of sign-in and authorization flows in the application. The device browser also provides improved security as applications are able to inspect and modify content in a web view, but not content shown in the browser. The Azure Mobile Client SDK provides the MobileServiceClient class, which is used by a Xamarin.Forms application to access the Azure Mobile Apps instance. 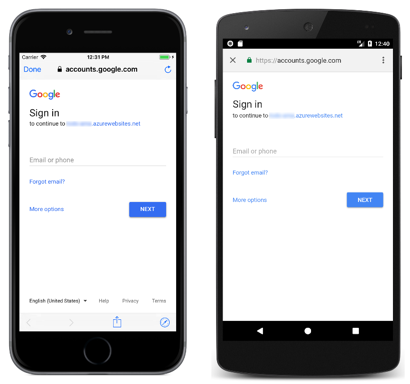 The sample application uses Google as the identity provider, which allows users with Google accounts to login to the Xamarin.Forms application. While Google is used as the identity provider in this article, the approach is equally applicable to other identity providers. While Google is used as the identity provider, a variety of other identity providers can be used, including Facebook, Microsoft, Twitter, and Azure Active Directory. The App.Authenticator property is an IAuthenticate instance that's set by each platform-specific project. The IAuthenticate interface specifies an AuthenticateAsync operation that must be provided by each platform project. Therefore, invoking the App.Authenticator.AuthenticateAsync method executes the IAuthenticate.AuthenticateAsync method in a platform project. On all platforms, the MobileServiceAuthenticationProvider enumeration is used to specify the identity provider that will be used in the authentication process. When the MobileServiceClient.LoginAsync method is invoked, Azure Mobile Apps initiates an authentication flow by displaying the login page of the selected provider, and by generating an authentication token after successful login with the identity provider. The MobileServiceClient.LoginAsync method returns a MobileServiceUser instance that will be stored in the MobileServiceClient.CurrentUser property. This property provides UserId and MobileServiceAuthenticationToken properties. These represent the authenticated user and an authentication token for the user. The authentication token will be included in all requests made to the Azure Mobile Apps instance, allowing the Xamarin.Forms application to perform actions on the Azure Mobile App instance that require authenticated user permissions. The App.Authenticator property is an IAuthenticate instance that's set by each platformproject. The IAuthenticate interface specifies an LogoutAsync operation that must be provided by each platform project. Therefore, invoking the App.Authenticator.LogoutAsync method executes the IAuthenticate.LogoutAsync method in a platform project. When the IAuthenticate.LogoutAsync method is invoked, any cookies set by the identity provider are cleared, before the MobileServiceClient.LogoutAsync method is invoked to de-authenticate the logged-in user with the identity provider. This article explained how to use Azure Mobile Apps to manage the authentication process in a Xamarin.Forms application. Azure Mobile Apps use a variety of external identity providers to support authenticating and authorizing application users, including Facebook, Google, Microsoft, Twitter, and Azure Active Directory. The MobileServiceClient class is used by the Xamarin.Forms application to control access to the Azure Mobile Apps instance.